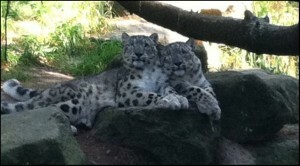 The Snow Leopards Are Coming…. Two Himalayan snow leopard sisters are relocating to the Big Bear Alpine Zoo this spring. They will be moving here from the Woodland Park Zoo in Seattle, Washington. Their names are Asha and Shanti and they were born with multiple ocular coloboma, a rare congenital eye disease. Here at the Big Bear Alpine Zoo, which is also known for its rehabilitation program they will be able to live together and receive expert medical care. 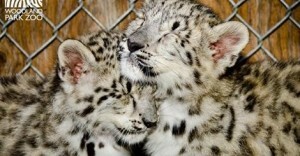 Asha and Shanti were born on May 2, 2012 under the Species Survival Program, a program that supports endangered species. Due to their congenital eye disease each one of them has had to have their right eye removed, this has not slowed them down in the least. However because of this disease they can no longer be considered for breeding in the Species Survival Program. We are looking forward to having the snow leopards join our family,” said the zoos curator, Debbie Richardson. “I hear they are quite rambunctious and should make for a lively exhibit. They are going to love their new home. Their exhibit will have a plexiglass-windowed viewing deck, a giant white rock mountain, a big tree and two rock dens”. The new snow leopard exhibit will emulate what the exhibits will look like at the new zoo location. In fact, the new snow leopard enclosure is being designed so that it can be easily moved and set up at the new location on Moonridge Rd and Club View Dr.
Below is a link to the Woodland Park Zoo’s newsletter about our new snow leopards, Asha and Shanti. Photos courtesy of the Woodland Park Zoo.